StampedeÂ® Technologies, Inc. (http://www.stampede.com) announced today at Gartner Symposium/ITxpo 2004 the availability of WebRiderÂ the first in its series of Web performance acceleration solutions. Responding to enterprise customer requests for better-performing advanced enterprise Web and portal applications, StampedeÂs WebRider delivers the newest and most innovative Web performance acceleration solution on the market. Visitors to Gartner Symposium/ITxpo 2004 October 19-21, 2004 are invited to learn first-hand the benefits and value of WebRider performance acceleration at StampedeÂs Booth #313 at the Walt Disney World Dolphin Resort in Orlando, Florida. WebRider is available for immediate shipment. Built on the Linux OS, and taking full advantage of 64-bit processing, WebRider operates seamlessly with leading enterprise applications, including Peoplesoft, Plumtree, WebSphere Portal Server, IBM Team Workplace, Microsoft SharePoint, Microsoft Outlook Web Access, Domino Web Access, IBM Lotus Workplace and more. Very easy to install and deploy, WebRider optimizes XML, J2EE and .NET environments, introducing significant financial savings; while at the same time increasing performance, response times and scalability of enterprise servers. Compatible with industry-standard hardware to support an enterpriseÂs migration to Web-based applications, WebRider is currently certified for compatibility with the IBM eServer line. Compatibility certification is underway for other hardware platforms. WebRider employs performance-enhancing technologies that no other products have, because Stampede Technologies holds the patents for them: Turbostreaming, SSL termination, intelligent cache validation, image transformation, content-aware streaming and adaptive compression bring significant performance enhancement. And, WebRider tracks bandwidth and throughput savings so that companies can quantify its value with the reports it generates. ÂAccelerated Data Flow. WebRiderÂs unique software approach uses enhanced compression, data streaming and cache schemes to take full advantage of 64-bit processing, so Web-based applications operate at blazing speeds. ÂReduced Network Processing Burden. By taking over such functions as SSL encryption, GZIP compression and TCP connection management, WebRider allows enterprise servers to concentrate CPU power on activities that are more important. ÂProvide Incredible Flexibility and Adaptability. Only WebRider is designed to offer all of these benefits to users of the leading Web-based applications built on XML, J2EE and .NET platforms. ÂDemonstrable Results. WebRider monitors Web traffic and generate reports that quantify the savings. WebRider is available now. It can be purchased as a software-only solution, or Stampede can pre-install the application on an IBM eServer and ship the entire integrated software/hardware solution. Price quotes based on license and configuration choices are available from Stampede Technologies; contact sales@stampede.com for a quote. Gartner Symposium/ITxpo is the IT industry's largest and most strategic conference, providing business leaders with a look at the future of IT. For more than 10,000 IT professionals from the world's leading enterprises, Gartner's annual Symposium/ITxpo events are key components of their annual planning efforts. Attendees are responsible for more than $ 35 billion in IT spending for their respective companies, and rely on Gartner Symposium/ITxpo to gain insight into how their organizations can use technology to address business challenges and improve operational efficiency. For more information, please visit http://www.gartner.com/us/symposiumorlando. Stampede Technologies is the leading provider of advanced, cost-effective solutions to accelerate information throughout an enterprise. StampedeÂs patented technologies improve performance, improve response times and increase productivity with concrete justification for verifiable ROI. For more information on Stampede Technologies, visit http://www.stampede.com. Stampede, WebRider, Stampede TurboGold, TurboGold, Multicator, AutoZip, JustZip is either registered trademarks or trademarks of Stampede Technologies, Inc.
Pronexus Inc., a leading provider of computer telephony and speech software solutions, today announced the availability of ReadiVoIP, the ÂRapid Enterprise Application Development in VoIPÂ starter kit. This special package enables developers to create, test, and deploy hardware-free IP telephony applications for the unmatched price of US$ 495. ReadiVoIP is upgradeable to a full development platform for the promotional price of US$ 1,750, which includes one year of unlimited eSupport by CYGCOM. The ReadiVoIP starter kit delivers cost savings and enhanced productivity to VoIP applications by bundling VBVoice from Pronexus, Host Media Processing software (HMP) from Intel and an IP phone. IntelÂ® NetStructureÂ Host Media Processing (HMP) software allows users to quickly and cost-effectively deploy software-only IP media servers. The media processing functions are handled on the host CPU, increasing performance while lowering overall system costs. PronexusÂ VBVoice further facilitates the development of VoIP applications by seamlessly supporting HMP software from Intel in a visual call flow environment integrated into Microsoft Visual Studio .NET. Â Pronexus VBVoice 5.2, 90-day enhanced evaluation version Â VBVoice is a rapid application development environment for business-critical speech and telephony solutions. The tool combines an easy-to-use visual call flow environment, with fully programmable controls. Developers can leverage familiar programming skills in industry-standard languages such as VB.NET, C# and other languages supported by Visual Studio .NET. Four runtime licenses are included in the bundle. Â Four IntelÂ® NetStructureÂ Host Media Processing (HMP) Resources ÂThis standard-based software from Intel enables customers to build full-featured, scalable, and cost-effective software-only IP media servers. It offers flexibility in configuring media processing features and cost of ownership savings, because it only requires a standard computer without involving any proprietary hardware. This allows customers to quickly and cost effectively bring additional features and technologies to their applications. Â Uniden IP Phone - Equipped with an integrated Ethernet switch and using Session Initiation Protocol (SIP), UnidenÂs UIP 200 VoIP phone will facilitate the testing phase of the application development process. Â CYGCOM eSupport - three months of Internet-based priority support services with a 24 hour response time to assist and provide availability to knowledge-based resources during the 90 day evaluation period. ÂVBVoice 5.2 lets developers realize the promise of HMP,Â commented Gary T. Hannah, President & CEO at Pronexus. ÂWe are pleased to offer developers the opportunity to experience the power of HMP at a minimal investment through this bundleÂ. The ReadiVoIP starter kit is available directly from CYGCOM, an Intel authorized distributor, at http://www.cygcom.com. For additional information on pricing PronexusÂ range of tools, solutions and services, visit http://www.pronexus.com. For additional Intel product information visit, http://www.intel.com/go/telecom. Founded in 1993, Pronexus Inc. is a leader in Computer Telephony and Speech. It is the developer of the award-winning VBVoiceÂ, and the new VBSALTÂ, Rapid Application Development tools for business-critical telephony and speech solutions. Pronexus also provides VeoSuite, a range of turnkey speech applications for Microsoft Speech Server and a complement of professional services that voice-enable a variety of industries and applications. Comprehensive support and acclaimed training complete the firmÂs offerings. About CYGCOM Integrated Technologies Inc.
CYGCOM is a leading Microsoft Speech Distribution Partner, Microsoft OEM and an authorized Value Added Distributor of Intel products. CYGCOM distributes speech and telephony integration products from the industryÂs most reputable manufacturers. CYGCOM offers solutions that are complete, powerful, fully programmable, scalable, and capable of running mission-critical enterprise communications applications. Through itÂs US and Canadian facilities, CYGCOM provides products, consulting services, on-site technical support, eSupport, helpdesk, systems integrations, education and marketing services for channel customers. For more information, please visit http://www.cygcom.com. Cayman Enterprise City (CEC), Caymans hi tech Special Economic Zone has rewarded the two young winners of The Coolest Internship in Cayman video contest with summer internships in the zone. During the month of June contestants in the Cayman Islands between the ages of 15 and 25 were asked to submit a short video making their case for the chance to work in the zone where 65 companies are now operating international businesses. 20-year-old Neith Rheingold, a second year student at the University of Westminster in London, convinced the judges that the internship is tailor-made for him. Im hardworking, motivated and I really want the opportunity to work at CEC because it fits right into my career choices, business management and international business, says the young Caymanian. I can learn a lot from the people at Cayman Enterprise City - get good advice, gain knowledge and do some networking. I hope to take this knowledge back to school with me. Cayman Enterprise City CEO Charlie Kirkconnell says the video contest was a good way to engage Caymans younger generation with the high tech tools they use on a daily basis, and get them thinking about the growing opportunities CEC will offer in the coming years. We have made a commitment to improve the future of young Caymanians by attracting interesting new technology-based industries to these islands, he says. The enthusiasm and creativity shown through the video contest is very exciting and encouraging, it shows us that our kids want to be involved. 16-year-old Thalia Ramos, a local high school student, also won an internship with a creative video that included animation and music. Neith and Thalia will learn the inner workings of the special economic zone by shadowing CECs teams from various departments; marketing, business development and client services. Theyll learn how to market the Cayman Islands internationally, work on lead generation projects and plan overseas business development trips and more. The interns will also be involved in Skype calls with potential clients around the world and participate in online presentations, plus face-to-face meetings. Im very excited, says Neith Rheingold. Im pretty sure Im gonna love it and will want to come back next summer. The interns will also learn about the logistics involved in helping a company set up in the zone, from the licensing process to the relocation of employees. Clients need assistance with local health insurance, pension plans, banking, service providers, accommodation, cars, shipping, movers and more. Neith and Thalia will also meet with some of the zone companies to learn about their businesses and industries, and experience first hand the growing tech hub at CEC. I hope to contribute my ideas to the conversation because I want to be a part of whats going on there, says Neith. 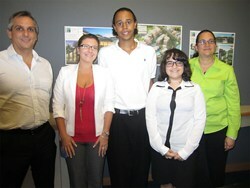 I think CEC is a great organization and they are going to do a lot of great things for Cayman. Hopefully when I graduate there will be an opportunity for me at CEC. We want the young people to come away from the experience with a good understanding of the zone, how it works, how it is marketed and sold internationally and to see whether these are industries they may wish to work in, in the future, says Charlie Kirkconnell, also understanding that he and the other Caymanians at CEC are important role models for the next generation. Cayman Enterprise City is a Special Economic Zone in the Cayman Islands, focused on knowledge-based industries, technology companies and specialized services businesses. International businesses can set up in the zone to take advantage of Caymans jurisdictional benefits along with some unique concessions. These concessions are designed to attract companies from five specific high-tech sectors: Internet and technology, media and new-media ventures, biotechnology, commodities and derivatives and academia. For more information call +1-345-945-3722 or visit http://www.CaymanEnterpriseCity.com. According to a June 23rd Computerworld article that summarized surveyed stats from technology provider CDW, 84 percent of employee respondents said tablets make them better multi-taskers at work. And this helps them gain just over one hour in daily productivity. When multiplied by the large number of workers enterprise-size companies typically employ, this increase in productivity time is dramatic. For example, many larger organizations that utilize Appointment-Plus enterprise scheduling software save tens of thousands of work hours each week. Tablets let employees perform their tasks more efficiently, as they can access work-related applications on the go, said Stephen Booze, CIO of Appointment-Plus. People tend to be more productive when theyre not tied down to a single computer. Tablets give them flexible options for managing and completing their job duties. Among the tasks that large organizations such as automotive dealerships and service-based franchises can easily manage with tablets are customer appointments. Online scheduling software lets staff instantly view their calendars and book appointments in seconds. Here are three reasons why enterprise scheduling software is the perfect fit with iPads and Android tablets. Innovators facing difficulties with launching start-ups or growing existing tech companies in Silicon Valley, or elsewhere in the U.S. because of H-1B visa caps and restrictions, will find a much easier path to entrepreneurship in Caymans high tech special economic zone, Cayman Enterprise City. H-1B visas allow American employers to import foreign workers each year to fill jobs that require "highly specialized knowledge," but these visas are notoriously restrictive and capped at 65,000. This year more than 124,000 visa applications were filed, so a lottery system was implemented and the work permits were gone in a week. Entrepreneurs who struggle through the process and are not picked for a visa have to leave the U.S.
Innovators are welcomed in the Cayman Islands, says Charlie Kirkconnell, CEO of Cayman Enterprise City. They wont encounter any visa difficulties when establishing in Cayman Enterprise City, and entrepreneurs can have their startup operating and their staff on site and working within 10 days. Companies with documented success in cloud computing deployments are being nominated for the first-annual Innovation through Cloud in Enterprise (ICE) Awards, produced by Cloud Connect and Everest Group and taking place at Cloud Connect, held October 21-23 in Chicago. For more information or to submit a nomination, visit: http://www.everestgrp.com/news-events/ice-awards-program/. The ICE Awards will recognize companies with demonstrated success in leveraging cloud computing to do more than reduce costs. Winners will have transformed business processes and unlocked new value by successfully implementing cloud strategies. The awards are produced through a collaboration between Cloud Connect and Everest Group. Everest Group is an an advisory and research firm on global services and business transformation through cloud computing. Cloud Connect is a global cloud computing conference and exhibition focused on implementation use cases with annual events in Silicon Valley, Chicago, Mumbai and Shanghai. The ICE Awards will select winners across a range of industry sectors, including consumer goods and retail, financial services, healthcare and media and entertainment. Additionally, a Viewers Choice award winner will be selected from among conference attendees via social media at the event in Chicago. eWEEK.com, one of the most trusted technology news and reviews websites, published and analyzed results from a survey of IT professionals and executives who are involved in the cloud computing purchase process. The survey was conducted by Palmer Research and QuinStreet Enterprise, the publisher of well-known IT media brands including eWEEK, IT Business Edge, Datamation and CIO Insight. Survey results show that 36 percent of respondents are now running a private cloud and an additional 29 percent plan on using a private cloud in the future. Cloud computing in all its variations is one of the two most important trends in the global IT industry, asserted Chris Preimesberger, editor of Features and Analysis at eWEEK.com. The other significant trend is Big Data utilization. In the article, we provide insight into how IT managers use cloud services now and their plans to use more of them in the future. 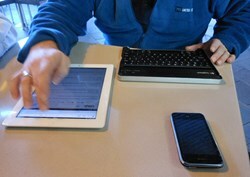 The eWEEK.com article discusses study results and details the importance of emerging trends. The article also touches on different cloud types (SaaS, IaaS and PaaS), brand awareness among cloud vendors, important criteria for early- and late-stages of the cloud computing purchase process and links to the full report for more detail. The survey was conducted online by Palmer Research using an email invitation sent to IT professionals and executives in the QuinStreet Enterprise North American database. 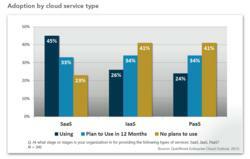 All respondents were involved in the cloud computing purchasing process. A total of 341 qualified professionals completed the survey between April 2 and 3, 2013. The margin of error is +/- 5.3% at 95 percent confidence level. For more details about the research studys findings and to download a full copy of the executive brief, visit eWEEK.com and join Tweetchat conversations every second Wednesday of the month at 11 a.m. PT using #eWeekchat, follow @eWEEKNews on Twitter and Google+. eWEEK.com, property of QuinStreet Enterprise, is an online resource in the IT industry, delivering technology news, analysis and reviews of new products. eWEEK.com is owned and operated by QuinStreet, Inc. (NASDAQ: QNST), one of the largest Internet marketing and media companies in the world. QuinStreet is committed to providing consumers and businesses with the information they need to research, find and select the products, services and brands that best meet their needs. The company is a leader in ethical marketing practices. For more information, please visit QuinStreet.com.